GSTR-1 is a monthly or quarterly return to be filed by all registered dealers. Irrespective of which GST billing utility you use, you can follow our guide to understand how to file GSTR-1 using ClearTax GST Software. If your turnover is below Rs 1.5 crores you have an option to file a Monthly or Quarterly return. These preferences have to be chosen by all dealers filing GSTR-1. 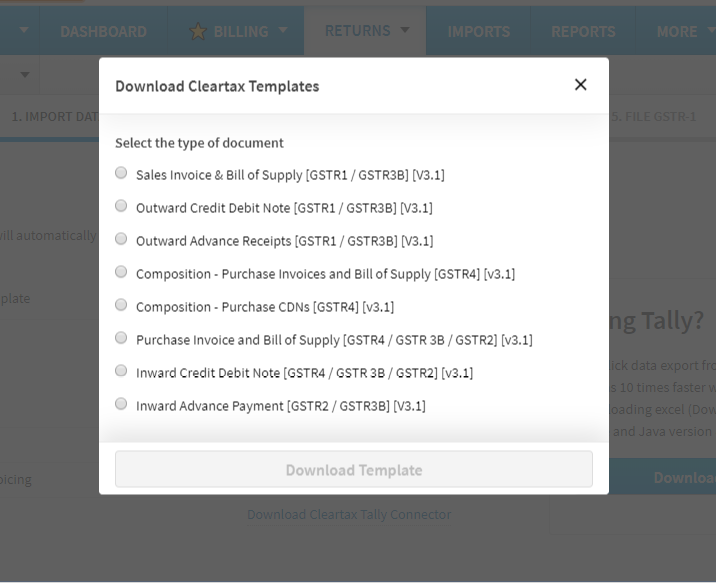 Step 1 – Login to ClearTax GST and select GSTR-1 from the GST filings drop-down menu in the business for which you want to file your return. Step 2 – Import or Add Sales Invoices : In the Cleartax GST software, one can either import the invoices through excel templates or add invoices by creating them online. 1. Click on the ‘Download Cleartax Template’ and choose an excel template from the list. 2. Fill in the Excel sheet with the details of sales invoices for a month. Make sure you don’t change the order of the columns. 3. Upload the excel sheet after you are done with the details of the invoices related to a particular period. 1. 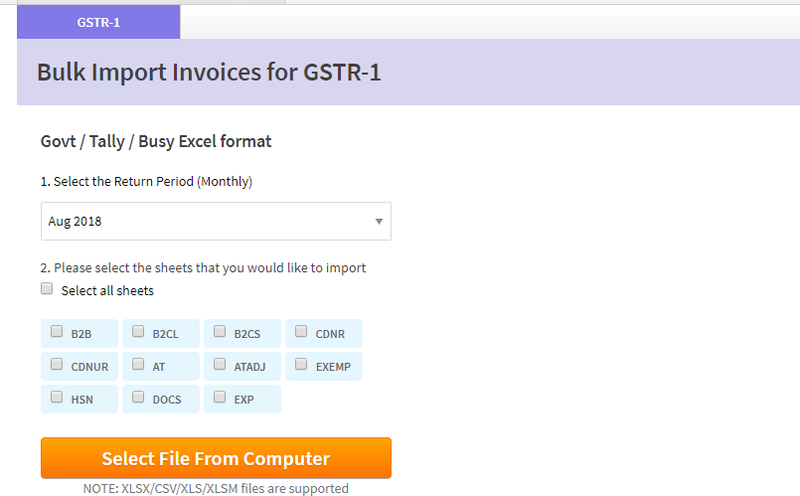 Export GSTR-1 Report from Tally/Busy accounting software or Governments utility in Excel(Spreadsheet) format. 2. Select the type of invoice being imported by ticking the checkbox. 3. Click on ‘Choose File from your computer’ and upload the XLSX/CSV/XLS file. B. Adding Sales Invoice/ Bill. 1. Move to ‘Prepare Data’ tab and then Click on ‘Create Invoices’. You can also select the period of the return from the drop-down menu on the right corner of the page. 2. Fill in all the details and ‘Save Invoice’. Here is a detailed guide on how to create an invoice. Step 3 – Verify auto-populated summary for B2B, B2C Large, Exports, Credit Debit notes. Nil Rated Supplies – This can also be auto computed. Step 6 – Enter your total Sales for the previous financial year and turnover for the period April to June 2017 and click on ‘Update Turnover Details’. Step 7 – Click on the ‘View all invoices’ tab and you can see as well as add or amend any invoices. 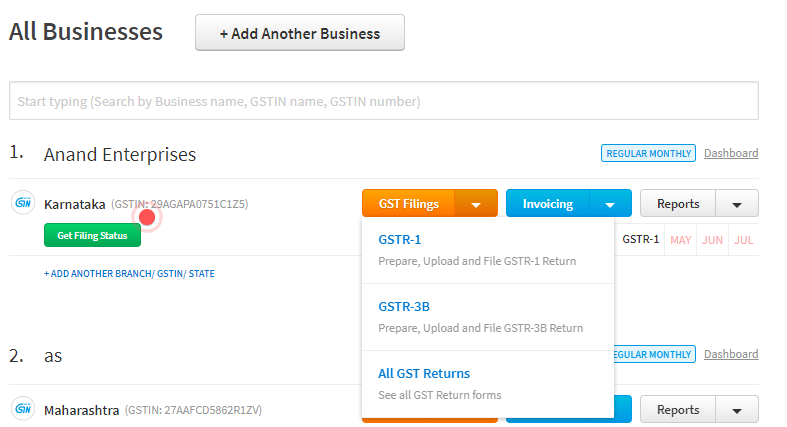 Once all the invoices are confirmed move to ‘Upload to GSTN’ tab. 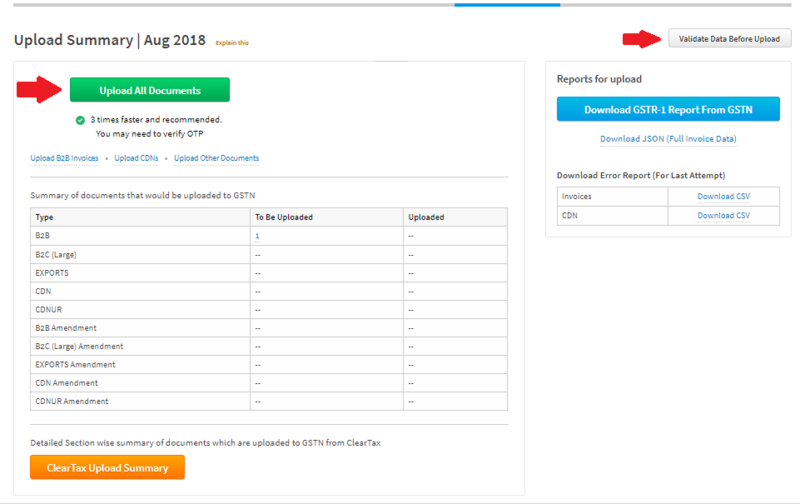 Step 8 – After viewing all the invoices, one has to upload the data to GSTN by clicking on ‘Upload All Documents’ with OTP (one-time password). You can upload several times before filing the return. Remember, uploading is not the same as filing return. You can also validate your data before uploading to GSTN. Having your login credentials saved on ClearTax GST will eliminate multiple steps in uploading data on the GSTN/GST portal. 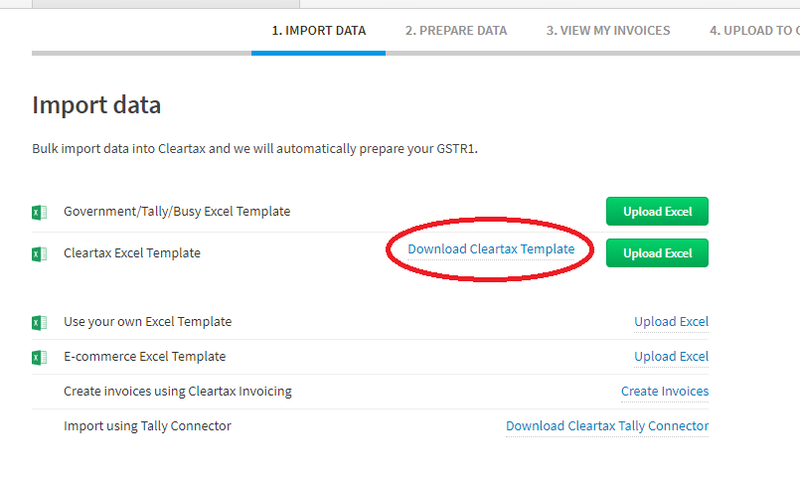 For successful upload make sure that you enable API Access to ClearTax from GST Portal. Step 9 – Review and freeze data. Make sure that you have not left out any sales invoices. 1. Login to GST Portal and go to GSTR-1 under returns. Click on Prepare online. Submit and File GSTR-1 on GST Portal. 2. 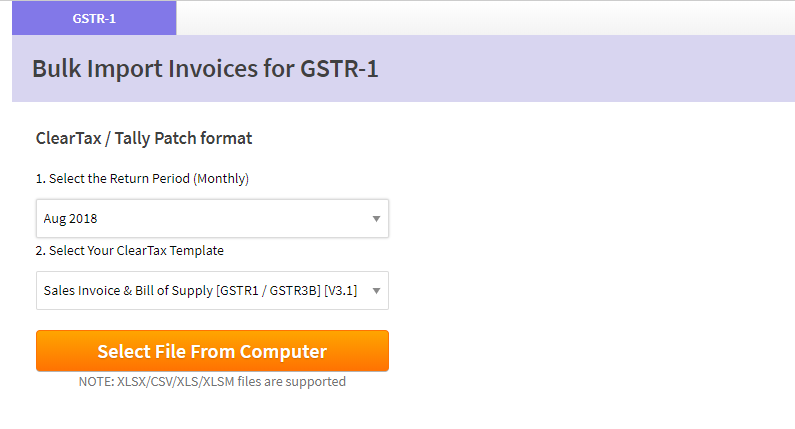 One can also Automate login to GSTN portal by installing the plugin. ClearTax GST software offers this Advanced Reconciliation Tool that comes with smart features. This tool helps you reconcile your purchase data with GSTR-2A in a 5X speed. This tool assures 100% of the ITC claim, intelligence to auto-identify and match invoices in the purchase data with the GSTR-2A downloaded from GSTN portal. 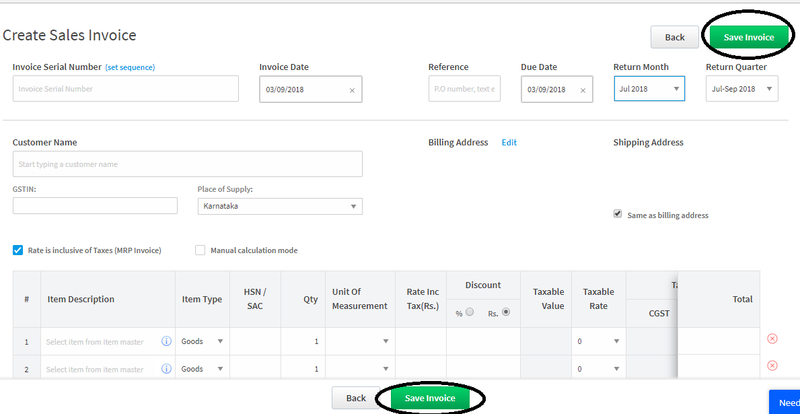 d. Missing In Supplier Data (Not In 2A)My Data – Shows in this section when you have uploaded purchase invoices but data is not present on 2A side. A. How to File NIL Returns – GSTR 1? 2. Why is the ClearTax GST Software not opening on my website? 3. How do I calculate the B2C Summary and the HSN/SAC Summary for GSTR-1? 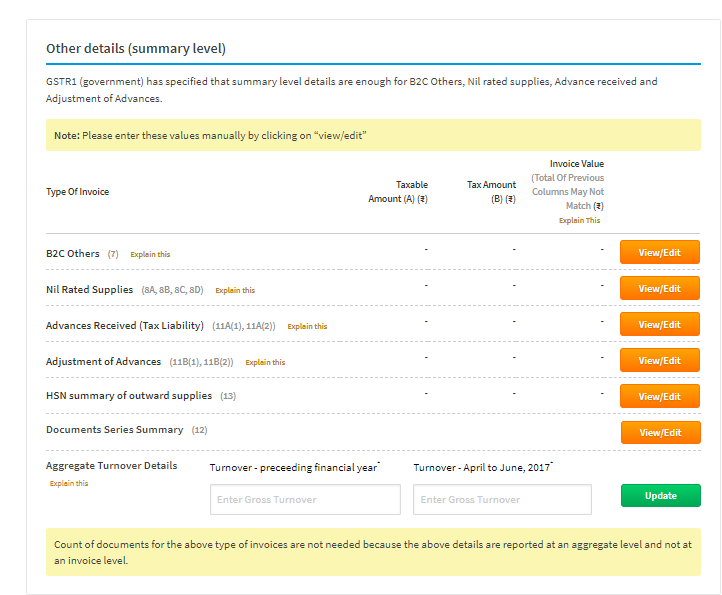 Both B2C summary and HSN/SAC summary are calculated on click of a button on ClearTax GST Software. 4. Can amendments be made to details already filed in GSTR-1? If yes, then what will be the filing period to make amendments? For example: Mr. X of Kerala has sold goods to Mr. Y of Karnataka for INR 1,00,000 on 30th August 2018 and declared in the GSTR-1 of August 2018. This amended invoice can be shown in the GSTR 1 of September 2018. 5. What should the ‘Revised date’ be in the amended invoice? The ‘Revised date’ to be mentioned in an amended invoice must be not later than the last date of the original invoice tax period. For example, if an original invoice dated 12/07/2018 is being amended in August then the revised invoice date cannot be later than 31/07/2018. 6. What are the amendments not admissible or not allowed? Note: However you may amend & link any other invoice for the same GSTIN. modified and the supplier accepts such modifications in GSTR-1A, he will not be allowed to amend those invoices. The reason is that those invoices will automatically get reflected in the GSTR-1 of the supplier in the month of such acceptance under the relevant amendments table. 7. What are the amendments allowable with respect to the Place of supply? You can amend the original place of supply for a transaction. You cannot add any new place of supply to a transaction. 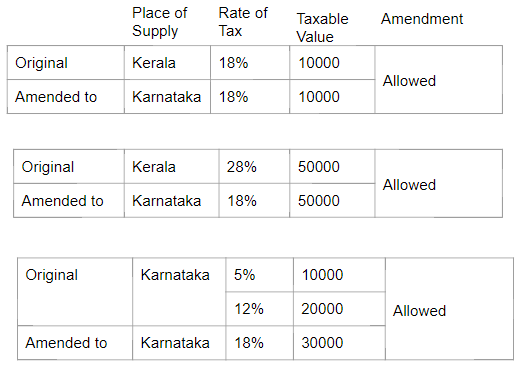 We can see that in all those cases where the original place of supply was amended from Kerala to Karnataka (whether or not there was a change in tax rates or invoicing), the amendment is allowed. 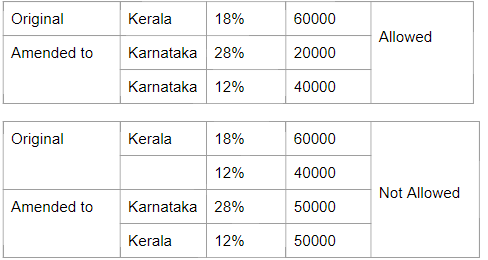 But in the last case where in addition to Kerala, Karnataka is also added as a place of supply ( irrespective of change in tax rates or invoicing ) amendment does not hold good. 8. 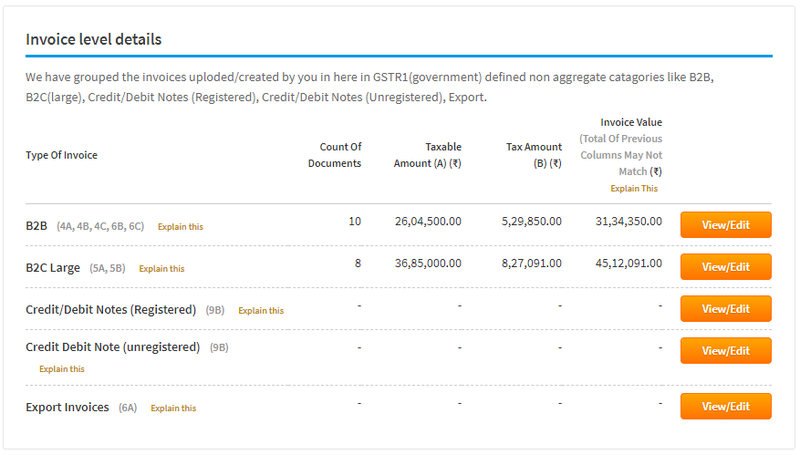 Where to show the amended invoices in GSTR-1? 3 Credit/Debit Notes (Registered) Amendments(9C) Credit or debit note amended against already issued Credit or debit note reported under B2B (i.e where supply is made to registered taxpayer), will be reported here. 4 Credit Debit Note (Unregistered) Amendments(9C) Amended Credit or debit note issued against original Credit or debit note reported under B2C Large and Export Invoices section, will be reported here. 5 Export Invoices Amendments(9A) Amended invoices issued against already issued original invoices must be reported here. 6 B2C Others Amendments (10) Amendments made in the invoices already issued earlier must be reported here. 7 Advances Received (Tax Liability) Amendments (11(2)) Any amendments made to the advances received in previous tax periods has to be declared here. 8 Adjustment of Advances Amendments (11(2)) Any amendments made to the advances adjusted in previous tax periods has to be declared here.